If you've never heard of Scott Pilgrim before, first of all, where have you been hiding? Sarcasm aside, Scott Pilgrim is based off a comic book of the same name. Here's the official synopsis: Scott Pilgrim's life is so awesome. He's 23 years old, in a rock band, "between jobs," and dating a cute high school girl. Everything's fantastic until a seriously mind-blowing, dangerously fashionable, roller blading delivery girl named Ramona Flowers starts cruising through his dreams and sailing by him at parties. But the path to Ms. Flowers isn't covered in rose petals. Ramona's seven evil exes stand between Scott and true happiness. Can Scott beat the bad guys and get the girl without turning his precious little life upside-down? 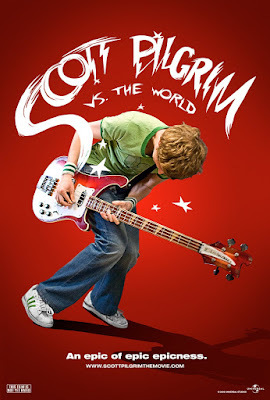 "Scott Pilgrim vs The World" is set to release August 13th. Stay tuned for more on Scott Pilgrim.